18 times winner of the World Travel Awards as Middle East’s Leading Airport is Dubai International Airport, which is the world’s busiest airport by international passenger traffic. It is also the 3rd busiest airport in the world by passenger traffic, the 6th busiest cargo airport in world, and the busiest hub for the Airbus A380. In 2015, DXB handled 78 million passengers, 2.5 million tonnes of cargo, and registered an incredible 403,517 aircraft movements. Dubai International is situated in the Al Garhoud district, 4.6 km east of Dubai, and spread over an area of 2,900 hectares (7,200 acres) of land. The airport is operated by the Dubai Airports Company and is the home base of Dubai’s international airlines, Emirates and FlyDubai. 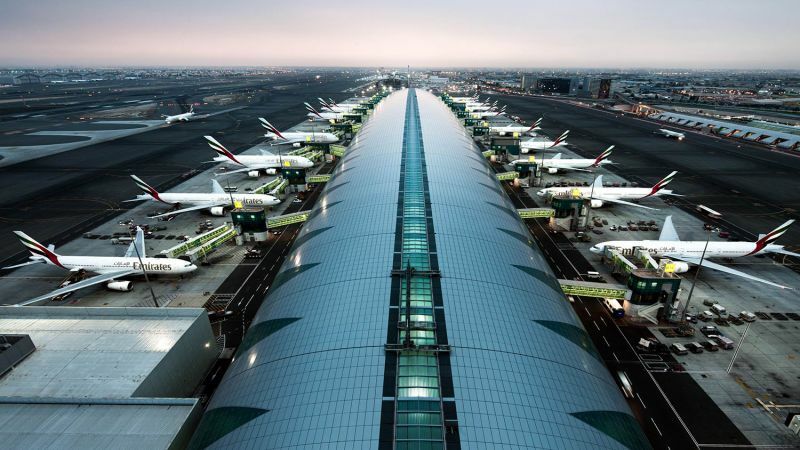 The Emirates hub is the largest airline hub in the Middle East; Emirates now handles 64% of all passenger traffic, and accounts for about 50 per cent of all aircraft movements at the airport. Dubai Airport is also the base for low-cost carrier, FlyDubai which handles 10.7 per cent of passenger traffic at DXB. The airport consists of three terminals and has a total capacity of 75 million passengers annually – and with the opening of Concourse D in 2015, the capacity will increase to 90 million annual passengers. Terminal 3 is the second largest building in the world by floor space and the largest airport terminal in the world. Dubai International is an important contributor to the Dubai economy, employing approximately 90,000 people, indirectly supports over 400,000 jobs and contributes over US$26.7 billion to the economy, which represents around 27 per cent of Dubai’s GDP and 21 percent of the employment in Dubai. It is predicted that by 2020, the economic contribution of Dubai’s aviation sector will rise to 37.5 per cent of the city’s GDP, and by 2030, the economic impact of aviation is projected to grow to $88.1 billion and support 1.95 million jobs in Dubai or 44.7% of the GDP and 35.1% of the total employment.